I was not someone who ‘always wanted’ a campervan. I have enjoyed tent camping for many years. We have camped in a tiny two man tent, a slightly bigger two man dome tent and a medium sized 4 man family tent. So I do understand and wholly support the desire for campsites free of caravans and motorhomes. 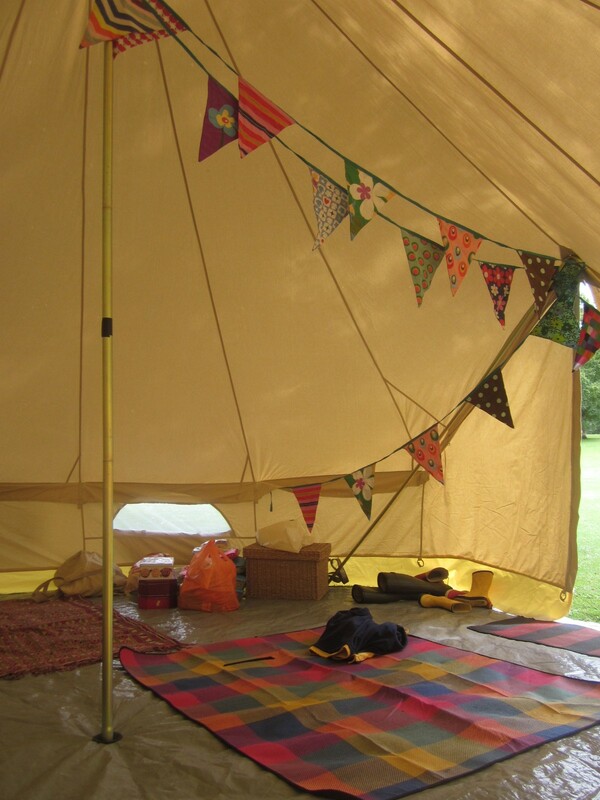 Recently there has been a surge in the use of bell tents and sites with yurts, I love this too. I constantly fight the urge to buy a bell tent, I don’t need one because we have a campervan. 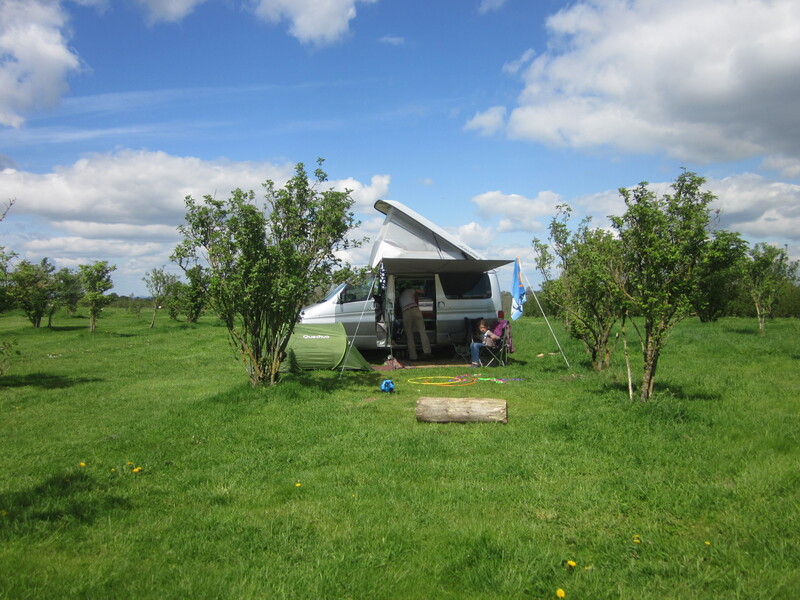 We decided to buy a campervan because we love camping, we love being outdoors, we love campfires and we love the way that even one night away can seem like a mini holiday. When you have two young kids the stuff you need to take camping increases dramatically as does the energy required to retrieve all the required stuff out of the loft, pack it into the car, unload it other end and set it all up, then do it all again when you come home. This meant we were likely to camp only a couple times a year. Finally, it dawned on us that a campervan could solve our problems. Getting the van (a mazda bongo) was an adventure in itself which I will relate another time, but when it finally arrived imagine my disappointment, as I eagerly started to research campsites, only to discover that a signifcant minority of the the type of campsite we love do not allow campervans. Usually it occurs at sites that ask that cars be parked away from the camping area, but please, campervans are unoffensive aren’t they? People who love to camp are being prevented from enjoying some of the best campsites. It’s campervan prejudice so come on, lets start a movement, be kind to campervans! How do you get on with the Bongo? We hired one when we were trying to decide if a camper was the answer (it was) but in the end we got a great deal on an F reg VW T25 which we love. You migh tbe interested in Forgewood just outside Tunbridge Wells – the kind of place you’d like – campfires, lots of woods for the kids to run free, bushcraft classes… Bit of a schlep from Bath, but we were there at the weekend (second visit) and it was great. Thanks for stopping by Recipe Junkie! Forgewood sounds very good, will add to the list of sites to visit. Oddly enough I grew up near Tunbridge Wells so it would be quite nice to return. The Bongo is fab, but I am biased! You have to get a good one and make sure it is undersealed properly. They are all made for the japanese market, they don’t use salt on the roads in Japan so if a Bongo comes to the uk and doesn’t get properly protected it will rust quite quickly. Apart from this they are great. Ours has been totally reliable. Love the automatic roof and blinds. Currently in the process of funking it up a bit with cushions and upholstery cos it is bit grey to start with. Really, easy to drive too. I will probably have a proper good rave about Bongo’s in a post very soon! before the owner just can’t resist putting on the radio or listening to their awful old albums ….just because they can, because they have power: and you know what? I don’t want to listen to Coldplay or the test match or in fact anything except the gentle sound of bird song on MY campsite….I mean er…THE campsite. Well…that’s my theory. Personally I’m with you, I’d love to get a Bongo (or even a Toyota Regius –such heresy) and I also really would like to camp at all those places that don’t allow vans. But this issue is putting me off going the small van route. What can one do? Thank for your comment. You may have a point about the use of sound. I have occasionally put on an audio book of for the kids when we are loafing around the van. But NEVER amplified music. Actually we don’t even do audio books anymore as having the stereo on drains the leisure battery. And I would say that although there are a few campsites you can’t visit with a van there are plenty of good, small, wilder campsites that do accept small vans. If there was somewhere you where really desperate to visit you can just resurrect the old tent! Great to hear you went the Bongo route! A lot of the campsites I have reviewed on this site (look at my ‘map of campsites’ tab) are what I would consider wilder sites, always allowing campfires, usually with no marked pitches, just a field of some kind. Definitely no club houses, rows of pitches or big white vans. Many sites state tents or small camper-vans and don’t allow large vans. Campsite owners are generally welcoming to smaller vans, I have found that the ones that don’t accept vans it’s usually because of planning or they are using an area with no vehicular access, campers have to haul their equipment by hand or wheel barrow. I haven’t ever camped in tent and used van as just a car but I have seen others doing it.